This Sunday, Costa Rica will experience an electoral event of utmost importance. While the people choose the new President of their country, two vice-presidents, and 57 deputies to comprise the Congress, this event will also show the nation the technology it seeks to adopt for the 2016 elections. Voters in 50 polling stations will be able to interact with voting machines that will automate suffrage in the near future. In its attempt to renovate the electoral system in order to lighten the burden put on polling station officers, as well as to safeguard results and optimize the process of vote tallying and aggregation, the country has set itself to design a piece of software that enables e-voting. The High Electoral Court (TSE) finished work last year and decided to test out the automated system during the February 2 elections for citizens living abroad. ying the equipment where the software would be installed, which was done last August. The implementation schedule demanded the conduction of six tests to allow 82% of the 12,654 Costa Ricans registered to vote abroad to exert their right in an automated way. The two first tests threw results that asked for changes suggested by the political parties —inclusion of blank vote—, as well as other technical aspects proposed by the Organization of American States (OAS). Although planning advanced significantly, last December Costa Rica decided to delay the automated election, as it was running out of time to carry out the last four tests demanded by the TSE in order to support this technology. te receipt on paper in order for citizens to verify that their vote was correct and to keep a printed backup of their selection. Even though the implementation process is meeting the demands of the electoral body, Costa Rica was right in suspending the electronic appointment. Best practices and the need for transparency towards the country demand the execution of all technical stages of training and organization, which allow e-voting to highlight the essence of suffrage and technology’s potential. At the core of every automated voting process is the voting machine, and Ecuador has set out to try three different machines with different technologies, in order to choose which direction to follow in modernizing their elections. On February 24th (during the country’s local elections) close to 1 million voters will not only select their regional authorities, but in a way they will also choose their voting system’s future. Ecuador’s strategy is to have its electoral technology scrutinized by both technicians and citizens; with this intend the country has designed a binding pilot e-voting test in the Azuay and Santo Domingo de las Tscáchilas departments, and an experimental one Quito’s sector of La Morita. Three voting machines will be employed, with characteristics that appear to be similar, but whose software will make a difference as the upcoming February elections will show. In this area, Ecuador chose to try out the e-voting model designed by Magic Software Argentina (MSA), which is in use in the Argentine province of Salta. It includes an electronic ballot box and a smart ballot that must be inserted in the machine; doing so enables the user to make his/her choice by means of a touch screen. The votes are stored in a chip for a later count. The equipment lets the user cast blank and null votes, and produces a printed voting voucher. The software generates opening and closing protocols, and vote count certificates for the election, but it doesn’t include automated tallying; the smart ballots must be inserted and read by a verification device embedded in the voting machine. This in required for the system to print and save a tally sheet, which is later sent electronically to a tallying centre. The e-voting system this region will try out is based on the technology being used in Venezuela for the past 10 years, supplied by Smartmatic. 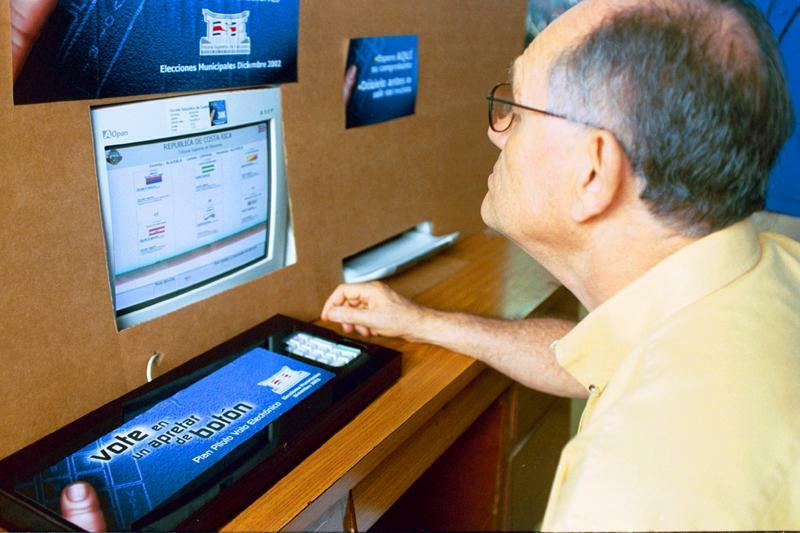 The voters select their candidate through a touch screen which requires user confirmation before the vote is finalized. After the vote has been cast, the machine prints a paper receipt that shows the voter’s selection. The software lets the voting machines store, count, tally and send the results in a safe, fully automated way. A characteristic of the system is that the process and the equipment in their entirety can be audited before, during and after the elections by technicians, citizens or institutions. The system contemplates several security measures, such as the redundant storage of the vote in several media and the safeguard of the voter’s identity through a randomized storage procedure. Users can check the printed vouchers against the results of the automated count. Russian technology will be used in an experimental capacity in this section of the country’s capital, Quito. These machines are activated by means of a security card with a barcode. Their touch screen displays the voting options, and after the voter makes his/her selection (which includes null and blank votes), the vote is stored and ready to be transmitted. 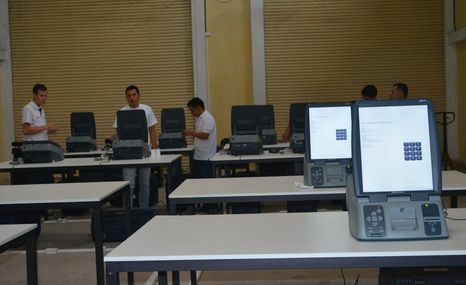 Smartmatic machines are already in Santo Domingo de los Tsáchilas. Photo: El Comercio. Simulating an election before the real one takes place is a tool that not many countries use, but which can be crucial for the success of the actual voting scenario. This experiment not only allows the people in charge to evaluate the technical and logistical performance of the process: it is also a priceless way for voters to familiarize themselves with the dynamics that will be in place when they exercise their right. Ecuador has understood and accepted this reality. The country will hold elections on February 23rd, which will be historical, since three different e-voting technologies will be tried out simultaneously; this has the final goal of automating the country’s voting system. However, in order to leave nothing to chance during the upcoming elections, the country will first execute four voting simulations. Next month, the Ecuadorian local elections will be predominantly manual. However, the provinces of Azuay and Santo Domingo de los Tsáchilas, as well La Morita (a section of Quito), will be pioneers in the use of voting machines in the country. During these elections, 23 provincial prefects, 221 mayors, 1,305 councilmen and 4,079 parish board members will be chosen. These four different simulations are to include all the steps that need to be fulfilled during a regular, formal election. 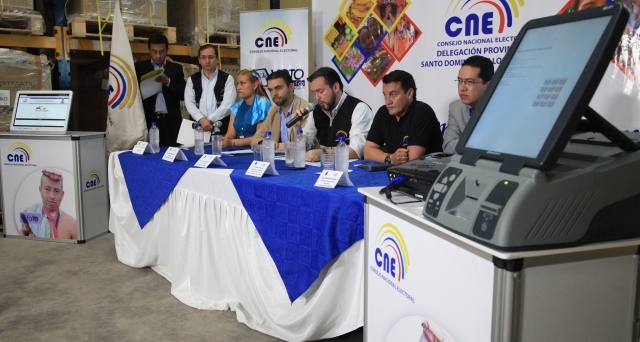 The Ecuadorian National Electoral Council (CNE) organized two nationwide technical trials (on January 26th and February 9th) where the system’s technical and logistical components will be put to the test, just as they will be on Election Day. The simulations include a monitoring of the deployment, contingency and roll-back procedures of the electoral material, the voting proper and the transmission of results. Added to these two macro-level tests, a voting simulation will take place on February 1st in Santo Domingo de los Tsáchilas, using technology provided by the London-based Smartmatic. In Azuay, a province that uses the same e-voting system as the Argentine province of Salta, the voting equipment will be tested the following day. CNE national advisor, Juan Pablo Pozo set the record straight: the voting simulations will allow authorities to evaluate the installation of the equipment, the voting, tallying and transmission of results. They will also test the efficiency of the system and perform the necessary corrections before the elections. By organizing these simulations, Ecuador is meeting its obligation to check the readiness of its automated voting system before elections take place. The nation’s commitment guarantees not only the operability of the system, but it also gives citizens a chance to learn to use the instrument they will use to reaffirm their political identity: the vote.